Jer-Den Plastics offers a variety of manufacturing services, including foam filling, to provide the quality rotational molded parts and finished products with all of the features you need – rapidly and affordably. As a “value-added” supplier, we can lower your costs – and reduce your time to market- with our efficient in-house foam filling services. Foam fillers have a broad range of applications in the plastics manufacturing industry. 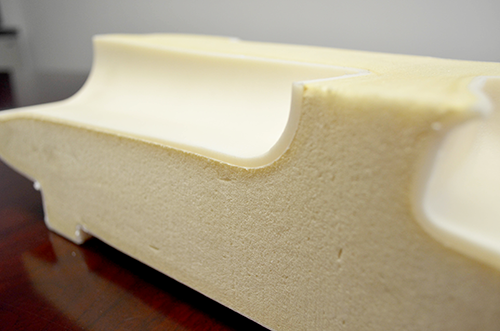 Foam filling is a unique manufacturing process consisting of “sandwiching” foam between two layers of plastic skin. Foam filling can make a product stronger, as well as add a variety of desired additional properties to the product – depending upon what type of foam is used. For example, we pressure fill marine products (such as markers and mooring buoys) using two part marine grade polyurethane foam to add both strength and buoyancy. Similarly boats, kayaks and canoes are often foam filled for the same reasons. Pre-insulated polyurethane pipes, on the other hand, are filled with foam that has insulating properties necessary for proper temperature control. Still other foam fillers – for example those used in housing construction components – are engineered to provide barrier protection against external noise and vibration. As a plastics manufacturer with decades of experience, one of our areas of specialty is also foam-filling voids or cavities in products. Using highly reactive polyurethane foam filler, we can increase strength, eliminate “creaking” and prevent cracking – without adding unnecessary additional weigh to your product – by filling the voids with foam. When we handle your rotational molding project, we will consider any foam filling needs you may have from the very first steps of engineering and testing your design. Because we are plastic manufacturing experts with years of experience you can trust us to design, manufacture and foam fill your components from the best and most appropriate materials for your unique needs. If you have a specialized manufacturing requirement for foam filling, our experienced engineers and plastic manufacturing professionals can design a custom solution to meet your unique needs. Contact Jer-Den Plastics today to discuss your foam filling needs.